DAILYMOTION: Belinda Stewart-Wilson on 'The Inbetweeners' movie. Primeval is a British science fiction drama television programme produced for ITV by Impossible Pictures. The first series started on 4 October 2007 at 21:30 as part of the newly launched "Thursdays Are Funny" brand on BBC2 and Thursdays on ABC2. 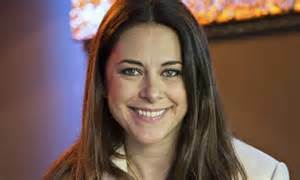 Belinda Stewart-Wilson is an English actress, best known for her role as Polly McKenzie in The Inbetweeners. Look Around You is a British television comedy series devised and written by Robert Popper and Peter Serafinowicz, and narrated in the first series by Nigel Lambert. The Peter Serafinowicz Show is a BBC Two comedy sketch show written by and starring Peter Serafinowicz. The Inbetweeners is a British sitcom that originally aired on E4 from 2008 to 2010. The Olympus Sound is the fifth studio album by Irish power pop band Pugwash. April 16 is the 106th day of the year in the Gregorian calendar. It features Hercule Poirot and Arthur Hastings. There are 259 days remaining until the end of the year. It was written and directed by series creators Damon Beesley and Iain Morris. He is best known as one half of comedy double act Armstrong and Miller, with Alexander Armstrong. Bennet Evan "Ben" Miller is an English comedian, actor, and director. Razzle Dazzle: A Journey Into Dance is a 2007 Australian mockumentary comedy film directed by Darren Ashton about competitive dance, first screened on 15 March 2007. Kiss Kiss (Bang Bang) is a 2001 English comedy film written and directed by Stewart Sugg. The Inbetweeners Movie is a 2011 British coming-of-age comedy film based on the E4 sitcom The Inbetweeners, written by series creators Damon Beesley and Iain Morris and directed by Ben Palmer. The Inbetweeners 2 is a 2014 British comedy film and sequel to The Inbetweeners Movie, which is based on the E4 sitcom The Inbetweeners. The Murder on the Links is a work of detective fiction by Agatha Christie, first published in the UK by The Bodley Head in May 1923 and in the US by Dodd, Mead & co in the same year. Hurst Lodge School, established in 1945, is a small non-selective independent school at Ascot, Berkshire, England, for girls and boys aged three to eighteen, with about 160 children of all ages. Lieutenant-Colonel Sir Blair Aubyn Stewart-Wilson KCVO was Equerry to Her Majesty The Queen and Deputy Master of the Household in the Royal Household from 1976 to 1994. It features Stellan Skarsgård, Chris Penn, and Paul Bettany. It features contributions from Ben Folds, Neil Hannon of The Divine Comedy, and Dave Gregory and Andy Partridge of XTC.